Hands up those of you who dislike having to mop floor/s? All that cleaning of the mop, or sponge mop is a pain isn’t it? Well we think so and when we heard about the Vida Steam Mop we were instantly interested. To offload all that extra rinsing, squeezing and changing water had been but a dream! With this steam mop all that is gone. All you have to do is add plain tap water to the reservoir, tie on a triangular micro fibre mop head, switch on and hey presto you can clean the floor with very little effort, get into the corners easily round chair legs and under tables. Leave the floor to dry – much quicker than with the wet mop – put the mop head in the washing machine ready for the next time. It’s that easy! The results on the floor? We have a stone floor, sealed, it holds dirt in the crevices which only a scrubbing brush would remove. The Vida mop coped very well indeed. The micro fibre head was pretty dirty after our mop over – the floor has been wet mopped for the last 10 years. Washed later in a 60º programme (important to use liquid detergent) the head came out clean enough to see it could be used next time. Let it dry and hey, job done. Instructions very easy to follow – how important is that! We did find the mop head difficult to tie on securely the first time we tried, and it did take a bit of effort to make it tight enough not to rub off. We would like a velcro or an elastic tie on. We would also have liked a second mop head as back up. Emptying the reservoir is a bit awkward. Another suggestion would be to have a clip to hold the plug to the lead when it’s stored away. The lavender coloured loop to help remove the mop head when it’s hot, mentioned in the instructions was not included. Out of 10? 9, and if our suggestions are taken up, it would be 10! So does the product checklist work for us? Ready to use in just 28 seconds -YES – it’s a breeze to assemble! Recommended – YES, highly, try taking it away and we’ll bite your hand off! At £44.99 we think it is well worth it. Available on line of course. PS Correction! Keep the mop – we had a flood in the kitchen the other day and we needed to mop up the lake that appeared. So glad we hadn’t thrown the mop out! Our garden has long but not very wide borders. We decided to clear them of unwanted plants and make them deeper and add curves to add interest and decide on a more varied planting. One unwanted plant with very deep roots is Centaurea Montana and some of the beds need a second deeper dig to remove new growth. The soil is easy to work and after I had a look at our garden tools I realised most of them are heavy, suited to my husband, not me. Also I managed to break the wooden handled spade I have used for years when digging up strawberry plants in a friend’s garden – her soil was quite compacted and harder to work than ours. When I found it was as expensive to replace the handle as to buy a brand new fork, I had a look at the Fiskars Garden Light range on their website. My husband had recently bought the edging tool which I found light and easy to use and wanted to see what else was available. Weighing only 1.4 kg each, I decided on the fork and spade. Each have lightweight, plastic coated aluminium shafts designed to reduce back strain and make garden work lighter. Just as attractive with regards to weight, the rake and patio broom just had to be added to the list! I already had Fiskars secateurs and multi purpose scissors Cuts+More – a really useful item to have around the garden and indoors – see list of features below. We did consider a garden shed to hold the tools and found some quite suitable ones on the web. In the end we decided another shed would be one too many and instead we utilised one end of the new woodstore. It gives easy access while protecting from the weather all our Fiskar tools. The pair of Fiskars scissors on the left hand side was bought about 1970 is still in use – simply love it! And a bottle opener for a well-earned drink in the shed at the end of the day! 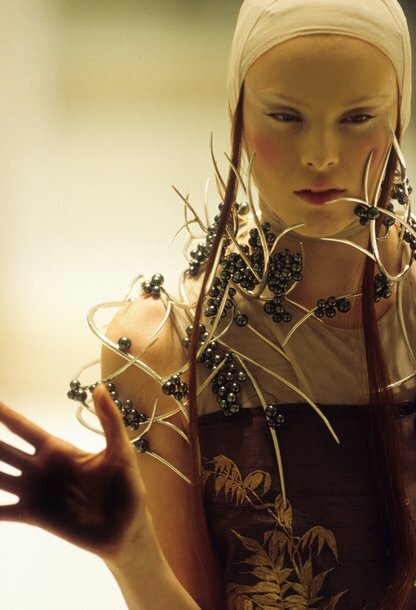 Heads up on a V&A exhibition for those readers interested in all things related to the provocative, dramatic and extravagant catwalk presentations that McQueen became renowned for, combining storytelling, theatrical performance, music and film. Scheduled for 14 March to 19 July 2015 this the only major retrospective in Europe of McQueen’s work. It promises a fascinating experience. The exhibition will show more than 200 ensembles and accessories, the largest number of individual pieces designed by McQueen and collaborators ever seen together, ranging from his postgraduate collection of 1991 to his final designs for A/W 2010, completed after his death. 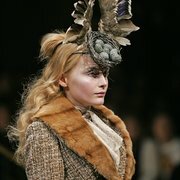 The thematic presentation will look into ideas and concepts central to McQueen’s work including subversive tailoring; Gothic sensibility and the interplay between darkness and light; primitivism and the animal world; heritage and ancestry; nature and the natural world; and technology and handcraft. Advance booking is advised – this can be done in person at the V&A; online at www.vam.ac.uk/savagebeauty, or by called 0900 912 6961 – a booking fee applies. We have just harvested our potatoes from the planter bags we started in April. We left harvesting for a month once they were ready and decided to move them out when there was a risk of frost. We had a reasonable crop – we love to eat our own grown veg and Desiree potatoes are popular with the family. We did nothing other than use fresh compost from B&Q and kept them from drying out, so regular checking and watering was a must. Our bags were 14 litre and gave us a lot of potatoes but nothing like the T&M crop – 80 tubers in one 8 litre bag! The method, hit upon during technical trials at the Thompson & Morgan seed and plant specialist’s Ipswich HQ, opens up potato growing to everyone – even those without a garden. The small but durable bags will sit happily by the front door or on a deep window ledge. More than 80 tubers were harvested from just one of these bags, nearly treble the number harvested from each tuber in the larger sacks. The results came from Thompson & Morgan’s new Potato Jazzy – an exclusive new generation first early bred for maximum yield and flavour, but the impressive results don’t stop there. Amateur growers tested the method this summer, too, when T&M horticultural director, Paul Hansord, challenged his local gardening club to a grow-off: three tubers of Maris Peer and three 8 litre bags – biggest harvest wins. “As with our technical trials, the club results were hard to believe. If I hadn’t cut the top growth from the winning entry and emptied out the crop myself, I wouldn’t have believed it. It was like the tubers were trying to burst out of the bags.” said Paul. Gwynneth Hogger took the winner’s cup for producing an astounding 17.5lb of quality potatoes – a trophy well deserved! Beat your neighbours to the first potatoes of the season – Harvest 12wks after planting! Try the 8 litre potato growing bags, beat Gwynneth’s 17.5lb harvest across three bags, and win £100 of T&M vouchers. Send a photo of you and your 2015 harvest to: kcollins@thompson-morgan.com – winners will be notified in July next year. Good luck! For the widest selection of tuber varieties and the 8 litre bags (20 for £9.99) visit www.thompson-morgan.com or call 0844 573 1818 for your free copy of the 2015 Kitchen Gardener’s Catalogue. You can imagine at In Balance we are planning on doing the same and have put in our order right away for bags and Jazzy the potato variety and of course make sure we get the bag of the Chempak® potato fertiliser!